Investors grew optimistic that the struggling social media specialist could make gains in a surging market for video content. Social media company Twitter (NYSE:TWTR) posted a 15% stock price gain last month, according to data provided by S&P Global Market Intelligence. However, the boost has left all but the newest shareholders staring at paper losses: Twitter is down 28% over the last 12 months -- and lower by 51% since its IPO. August's boost came on the heels of a largely disappointing second-quarter earnings report that showed an 18% rise in advertising revenue, compared to Facebook's (NASDAQ:FB) 63% spike. 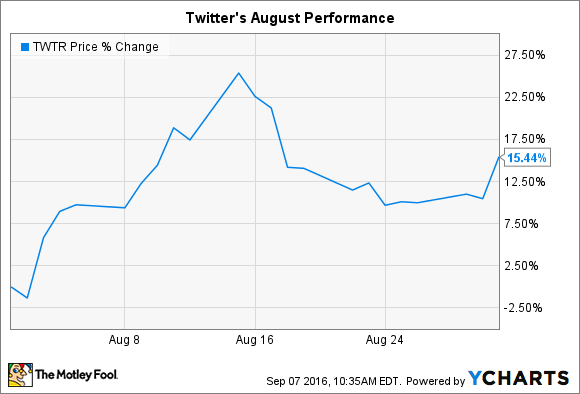 Unlike its much larger networking peer, Twitter is operating at a loss and faces nagging questions over user growth and monetization trends. The service has a large base of content producers, though, and it remains a key platform for following breaking news and live events. That's why shares spiked in the middle of the month on news that Twitter is working with tech giant Apple in a bid to get its service onto the Apple TV. Twitter beat Facebook for the rights to live-stream a batch of NFL football games this season, and a link up with Apple would bring that content to tons of additional viewers. Whether or not Twitter gets closer with Apple, video will be a key battleground for social media content over the next few years. In fact, according to Facebook CEO Mark Zuckerberg, his company is moving toward "a world where video is at the heart of all our services." Twitter is working hard to establish a strong foothold here as well. "We remain focused on improving our service to make it fast, simple and easy to use, like the ability to watch live-streaming video events unfold and the commentary around them," CEO Jack Dorsey told investors in July. In just the latest example, in early September the company promoted live video around the U.S. Open tennis championship. Investors should look for lots of activity and new initiatives in this arena, but they likely won't push the stock significantly higher until the moves produce evidence of higher user growth and improving advertising revenue trends.